Sixty-nine crop production budgets track revenue and costs for 16 crops and a variety of production systems. 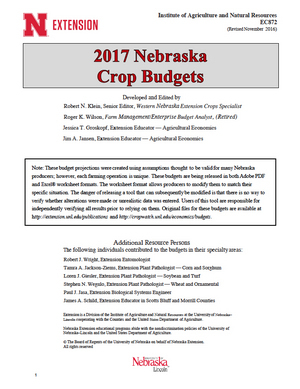 Individual budgets are available at CropWatch.unl.edu/economics/budgets as PDFs and as Excel files that can be customized for individual farm operations. This resource also includes tables of power, machinery, labor, and input costs used to develop the budgets.